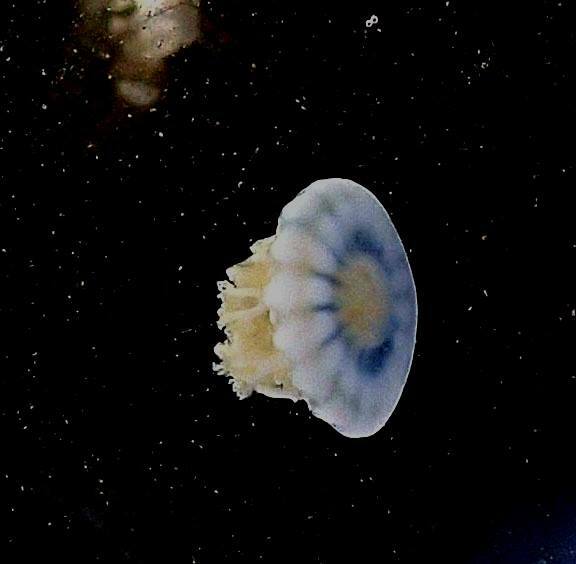 The Upside-down Jellyfish, Cassiopea ndrosia | Marine Life Society of South Australia Inc. The last thing that I expected to be doing on the first days of my recent retirement from work was studying jellyfish, but that’s exactly what happened! That’s just the way that things go sometimes. It all started over the Queen’s Birthday holiday long weekend last June though, as far as I can determine. That was the weekend that I decided to go kayaking alone at Garden Island. I think that I noticed an upside-down jellyfish in the shallow water at the edge of the Port Adelaide River near the Garden Island boat ramp. I took this one photo of the jellyfish before heading out in my kayak. I subsequently posted copies of my jellyfish photo on our own Marine Life Society of SA Facebook page and the SA Natureteers page, with comments such as “I found this little up-side down jellyfish in the shallows of the Port Adelaide River at Garden Island”. Lisa-ann soon added another post to the “I Friggin Love Jellyfish” page, saying “G’day friends, It is with extreme excitement and blushing pride that I announce that The Jellyfish App is now available on the App Store. The Android version should be released in a matter of just days. Both pro (US$1.99 / AU$2.99) and free versions are available. The Jellyfish App is a one-stop resource for safety and identification of jellyfish of the world. It currently features about 250 of the world’s most visible species, along with the less visible, more dangerous ones. The App is suitable for divers, fishers, tourism operators, beach combers, naturalists, and others interested in squishy beasts. I’m unable to install “The Jellyfish app free’ on my old i-Phone. 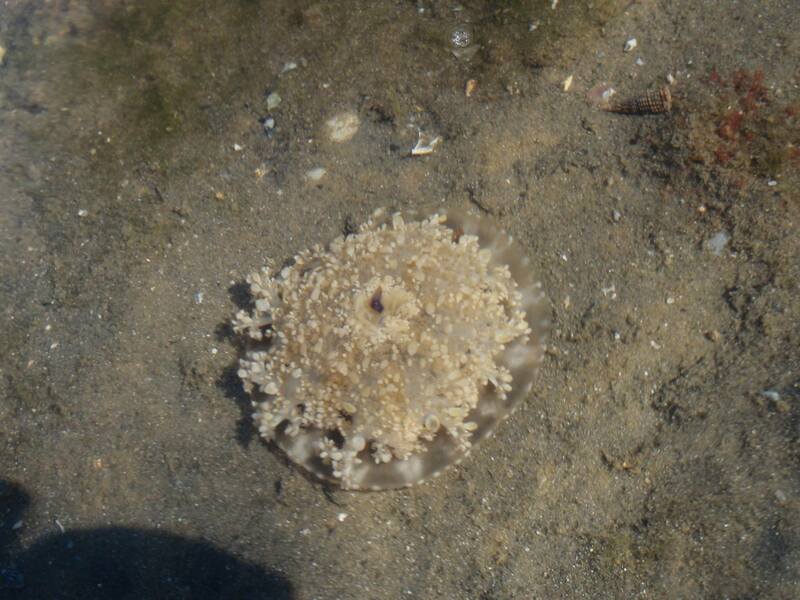 I recorded my jellyfish discovery (with photo) to the Atlas of Living Australia (http://www.ala.org.au/ ). It seems that there had only been one previous record and no photos had ever been provided to the Atlas. “Medusa to 110 mm wide. Exumbrella flat to slightly concave. Rhopalia 18-22 in number; rhopalar pits smooth, with radial folds. Lappets at edge of umbrella very indistinct, four to each octant. Subumbrellar muscles present in feather-like arcs.. Mouth-arms branch irregularly, tree-like with cylindrical branches, and may reach out to 1.5 times bell radius. Over mouth-arms there are numerous small , flattened or expanded vesicles between numerous mouths; no ribbon-like filaments present. “Generally, Cassiopea is considered a tropical genus, found in shallow, sheltered waters. Cassiopea species commonly lie upside down on the mud or sand, waiting for food particles to be caught in the mouth-arms. Some species of Cassiopea are known as severe stingers. About ten species of the genus are recognised for the three great oceans. Cassiopea ndrosia has previously been recorded from Fiji, New Caledonia and north Queensland. “Specimens of this species of medusa, to 115 mm across, occur in Angas Inlet*, Port (Adelaide) River, South Australia, near the warm water outlet of the Torrens Island Power Station at temperatures of 5-8° above ambient. 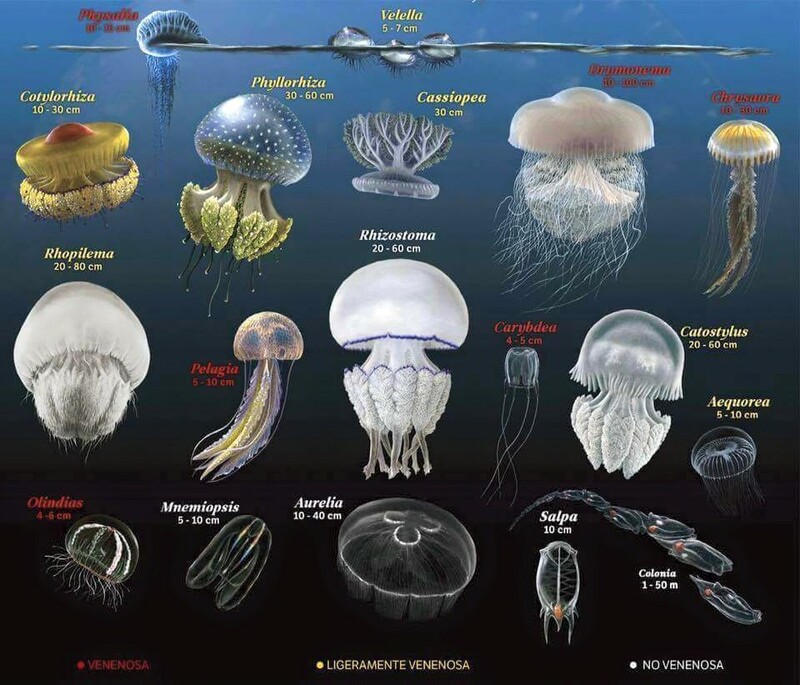 There are two photos of Cassiopea ndrosia in the book, as Plates 15.3 (aboral aspect) and 15.4 (subumbrellar aspect). Thanks for doing this detective work, Steve. And double thanks for pointing out another specimen this morning, between the Garden island jetty and adjacent mangroves. I also shared my pic on the page “I Friggin’ Love Jellyfish” and have found its host, Lisa-Ann, to be very helpful and generous with her expertise. Thanks Dan, I’ll check out your shared photo. I hope to share some of my own too. I saw what I think was a cassiopea on the Noarlunga Reef about 19.4.18. It had a lot of little fish hanging around its tendrils. A real prize of a site for a snorkeller. It was a lilac colour and the bell was clear. Maria Vouis PS I have only seen two of these over the years I have snorkelled here about 10 years. A great moment for you Maria, for sure! We can expect the unexpected. Some events will stay with you for many years.